Holiday Gift Idea: Crumbs Cupcakes | Fashion. Style. Beauty. | Life is short. Live well. When I was a kid, one of the best presents I remember getting every year had to do with food. Other than a fruitcake that can double as a doorstop, I’m into any gift that allows people to get together and eat. Popcorn tins are so last…decade. How about sending a little lovin’ from the oven that will REALLY have them raving for years? Ladies and gentlemen, if you want to collect your award for The Best Gift This Season, send cupcakes from Crumbs Bake Shop. An institution in NYC and Los Angeles that sends many of us squealing into any gathering like tweens at a Jonas Brothers concert when they arrive, Crumbs cupcakes are some of the most amazing confections that have ever been allowed to be created on Planet Earth. I mean, you could send basic vanilla and chocolate and still have them screaming with delight, but let me just throw some of the flavors from these oversized drops of joy: Chocolate Covered Strawberry, Caramel Apple (my personal favorite), Cookie Dough, Chocolate Pecan Pie, Fluffernutter, Oreo (as in the real cookies), Peanut Butter Cup (again, with real peanut butter cups on top) and so many more I don’t have room in this post. I get giddy walking past the store every day and to know that I can share this love with you across the country, my friends? I weep with happiness. 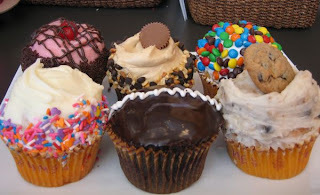 You can create your own custom Six Pack of these delicious cupcakes and they will ship your little box of heaven on dry ice anywhere in the country, where the darling confections will thaw in 3-4 hrs after being removed from their travel vessel. Afterwards, I suggest you try not to break your arm patting yourself on the back after all the amazing “Thank You” cards, phone calls and offers to bear your children start pouring in. Send them wherever you want this holiday season or, Hell, send a box to yourself. It’s been a rough year and we all deserve a little treat this season. No matter what the occasion, there’s always one amazing gift solution that can be delivered with the click of a mouse: Crumbs cupcakes.